Researchers from the Faculty of Pharmacy at the University of Calabria in Italy publishing in The FASEB Journal report that resveratrol blocks the effect of estrogen and can help to prevent the malignant growth of breast cancer in women. The grape/red wine derivative has been the subject of numerous scientific studies in recent years and has shown promise in lowering risks from cardiovascular disease, cancer and dementia. Scientists also believe the protective nutrient may extend healthy lifespan by directly influencing mortality genes known as SIRT. Health-minded adults will want to include resveratrol from natural food sources or supplementation to reap the numerous health benefits. To design their study, researchers used several breast cancer cell lines expressing the estrogen receptor to test the effects of resveratrol. They exposed the different cells to a solution containing resveratrol and compared the results to cells left untreated. They found an important reduction in cell growth in cells treated with resveratrol, while no changes were seen in untreated cells. 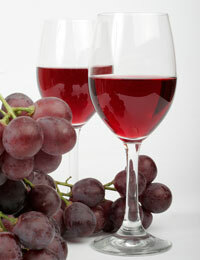 Further experiments determined that this effect was caused by a critical reduction in estrogen receptors caused by the administration of resveratrol.Resveratrol Supplementation Suppresses the Growth of Malignant Breast Cancer CellsThis finding is the first of its kind as it relates specifically to the effect of resveratrol on a particular cancer cell line. The team was able to conclude that resveratrol is able to counteract the malignant progression of breast cancer cells by inhibiting the growth and spread of hormone resistant cancerous cells. This has important implications for the treatment of women with breast cancer whose tumors eventually develop resistance to hormonal therapy. A peer review board examining the study data concluded "scientists haven't finished distilling the secrets of good health that have been hidden in natural products such as red wine." It is important to note that in this body of research, resveratrol only demonstrated an effect on malignant cancer cells and exerted no effect on non-cancerous cells. While the authors cautioned that people should not go out and start using red wine or resveratrol supplements as a treatment for breast cancer, the finding strongly indicates that the plant-protective compound should be considered as a component in an overall plan designed to prevent the devastating disease. Nutrition experts recommend a supplemental intake (from a purified, organically derived source) of between 50 and 250 mg per day for optimal health benefits.